When Frank McDonough contacted us, he was opening up a new business as a Roof Shampoo® authorized contractor. He needed a great website that would function as a brochure and first impression for the services he would offer customers locally. We created and built a custom Web site design for Frank with a “look & feel” that would make customers feel confident about hiring him, and assured that they would receive a quality product. 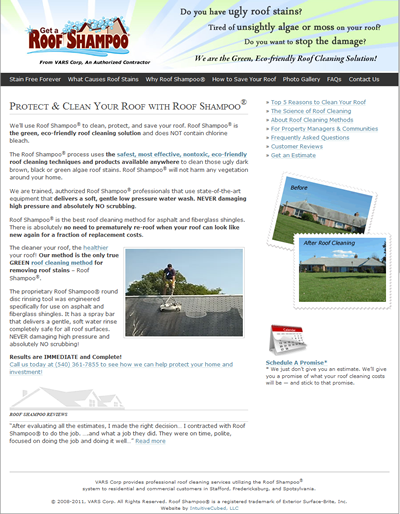 We organized and lightly edited content available to him as an authorized Roof Shampoo® contractor. This Web site allowed him to put his best foot forward…to win over customer before they even met him. Frank was delighted and found that nearly everyone who visited the Web site called him for an estimate, and then hired him for the job.